These quartz flakes in Gairloch Museum are a small fraction of the worked tools, raw material and debris found at Redpoint, near Gairloch over the past decades in an area of wind-blown eroding sand dunes. Recently the Scotland’s First Settlers (SFS) project collected over 2000 lithics (currently in store for the National Museum of Scotland). The site was in use over a long period of time, as shown by Mesolithic microliths, Neolithic leaf-shaped arrowheads, and this rough out for a Bronze-Age arrowhead. Although quartz was most common material worked on the site, examples in mudstone, bloodstone (imported from the island of Rum), chalcedonic silica and chert were also found. Together they indicate a tool making area in use for thousands of years, and the earliest evidence of people in Gairloch parish. Two nearby unexcavated rock shelters may also have been in use at the same time. Hardy, Karen & Caroline Wickham-Jones (eds). Mesolithic and later sites around the Inner Sound, Scotland: the work of the Scotland’s First Settlers project 1998–2004. Scottish Archaeological Internet Reports SAIR 31. Available on-line at www.sair.org.uk/sair31. See in particular section 2.2.52. Gray, A.F. 1962. 'A collection of stone artifacts from Redpoint, Loch Torridon, Ross-shire', Proceedings of the Society of Antiquaries of Scotland, Vol 93 (1959-60), pp 236-7. Available on-line . 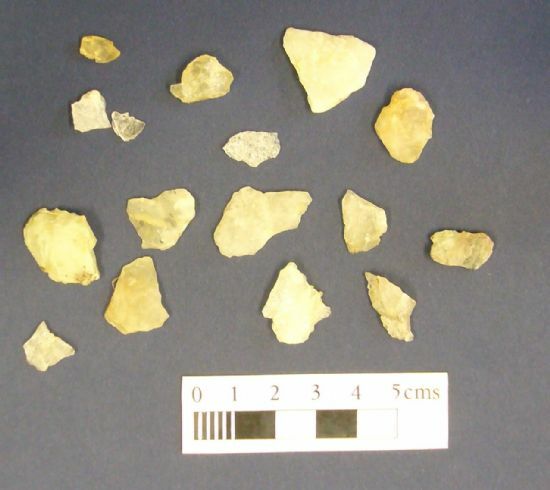 These lithics are one of a number of sites, buildings and finds featured in ARCH's Community Timeline display. A display illustrating the rich heritage of the Gairloch and Two Lochs area is currently touring, and will be in Poolewe until 15th of July 2011, then Gairloch Library from the 18th July to 12th August, and at Aultbea Hall from 15th August until 2nd September. Binders with resources collected during the 6 week course are in Gairloch Library and Gairloch Museum.